Enjoy a real treat for your palate at the Tavern-Grill Restaurant "SYNANTISIS", run by Kostas Karkalas' family. Knowing the secrets of traditional Pelion cuisine and selecting the best ingredients from a wide range of local products, Kostas Karkalas' family prepares unique dishes that you can rarely find and you will be delighted to try. Start your meal with our scrumptious appetizers, freshly prepared on a daily basis by Mrs.Ria, daughter of Kostas Karkalas. Traditional spetzofai, giant baked beans, homemade tzatziki and Greek garlic dip are ideal starters that you can have together with a glass of tsipouro before your main course. The restaurant owners have dedicated their whole life to developing their style of cooking and enriching the taste of their dishes. The main dishes that the restaurant serves, such as veal stew, rooster braised in wine, lemon lamb and crock pot veal win the hearts of customers, who cannot forget their delicious taste. All meals are prepared with virgin olive oil which is produced in our region. In our griil-restaurant you can enjoy fresh local meat, grilled with special care by Mr. Vasilis, who has learned the secrets of the art by his father-in-law Kostas. Our popular kokoretsi, kontosouvli pork, kleftiko and lamb spit are real family heirlooms passed down through generations. In summer you can taste our delicacies in the yard, under the traditional pergolas, while in winter you can dine indoors in a cozy environment next to the fireplace. 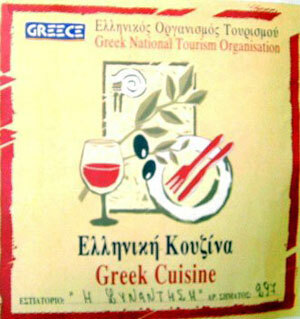 The Tavern - Grill Restaurant "SYNANTISIS" has been certified with the trade mark of Greek cuisine, awarded by the GNTO (Greek National Tourist Organization), for its excellent service and its guaranteed food quality.